This new truck makes moving and dispensing a breeze! 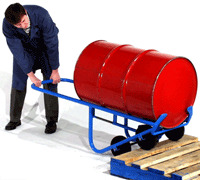 It can also be used to move drums on or off pallets. Four equally large 8" polyolefin roller bearing wheels carry the load, no burden for the user. 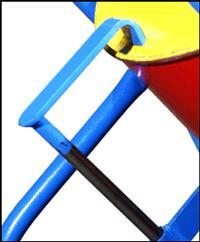 Extendable support prop allows it to self-stand for storage and stabilizes it in dispensing position. Toe prongs are set at precise angles to load efficiently and are broad and blunt to protect plastic drums. 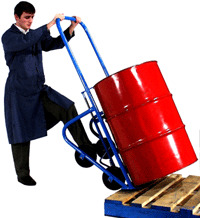 Handles drums 14-28" diameter and 29.5 - 41" tall including 55 and 30 gallon steel drums, 85 gallon salvage drums and most late model plastic drums. Also for fiber drums with sufficiently deep rim recess for hook engagement. 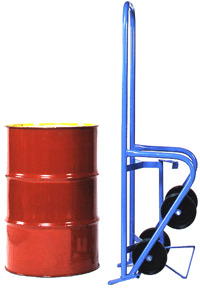 Optional: Pneumatic tires MO-160-WP and Model MO-160-WP-S- the MO-160-WP-S is a soft solid rubber tire (Never Flat). 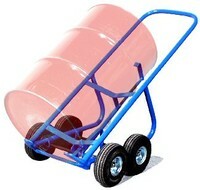 Great for gravel or off road drum handling.